I cannot begin to tell you what a fun experience this was for me. I have never had the opportunity to be a member of a book club, although I have wanted to be a part of one for years and have even tried to start one several times over the past few months. I considered this mini-challenge my first book club experience, and I thoroughly enjoyed it. Nymeth challenged us in two ways in what she called the “Try Something New” mini-challenge. First, participants were asked to select a genre of literature that is outside their typical comfort zone — and then, to partner with another blogger and share experiences. I was so very fortunate to have Susan as a partner, and I am sure I learned as much from her as I did from the reading selection. We both wanted to try a graphic novel, but rather than reading the same novel (as would be the case in a typical book club format) – we chose two different novels. Susan chose The Watchmen and immediately took to it like a fish takes to water. She loved the action – the super heroes – the good vs evil theme – as well as the nostalgic references to the Cold War (which was the essence of all current events when we were in high school). I tried to get into the book – I really did. But action adventure – super hero stories are just not my cup of tea. So Susan and I decided to read separate novels, but compare experiences. 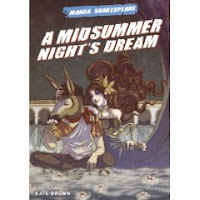 You can read about my experience with Manga Shakespeare at her website, and I will share her experiences with The Watchmen here. Over the course of the past 4 -5 weeks we have emailed each other quite a bit – asking one another questions and providing possible insights along the way. Susan, I hope I do you justice! I’m enjoying Watchmen so much. It’s sooooo good. I think I’ve slowed my reading down because I don’t want it to end! It’s bringing back a lot of the 1980s for me: the style, the tone, the news, the clock ticking, the threat of nuclear war, the doom and gloom and uncertainty about everything back then. What did you like best about the Watchmen? Was it the action/adventure plot? The super-hero characters? The theme of good vs evil? I really enjoyed the entire novel. It was moving, powerful, passionate, stirring, striking, ground-breaking. It is an experience. I didn’t agree with it all — I hate that Rorschach died at the end!! I cried and cried because although he had the least ability to relate to people, he became the conscious — the desire for truth to get out. So, I know that in this dark world he had to die – he was too dangerous – but it still hurts, as it ought to. I am glad that some characters lived! Although, I was so totally shaken by how and why the deaths were happening and what happened in New York City — it was terrible; it was monstrous; and all the result of one man’s insanity. But isn’t that what the threat of nuclear war comes down to? Insanity. It is insane. The arms race is insane – threatening to destroy one’s neighbor is crazy, and the dark cynicism and horrible comic book story (the pirate ghost ship) secondary story really brings home the underlying despair I think the 20th and now the 21st century feels. The question seems to be: Why does it matter? And the answer is found, as it always is in life and in the novel too — in the small things: the relationship of Sally and her daughter Laurie; of Laurie and Dr. Manhattan; Laurie and Dan; Rorschach with everyone. Because if we don’t have something to hang on to, then nothing means anything, and it doesn’t matter. Something must matter, whether it’s justice, or truth, or love — all the things the Watchmen were defending. Did you find this novel to be suitable for all audiences? I’d only let older teens and adults read it; it’s NOT for kids at all. However, Duncan (my son) is very eager to read it and is constantly asking if I’m done yet. So it’s a book that appeals to adults both young and not so young. The story brings back a lot of memories from the 1980s. At that time I was in my 20s and just starting out. It was a difficult conflict to resolve: do I plan for the future knowing it may be blown up? Do I live just for today? Questions which I know my son, as a 20 year old, is currently asking himself. He watches the news with Russia and China intently and is convinced the world is doomed to WW3. Not me though! I keep thinking we have a choice — and funny enough, I think that’s what Watchmen is about too. What was your initial reaction to the Graphic Novel form? How did you feel about it when you finished the book? I tend to think this is cultural. Certainly when I reached 12, my mother was furious that I was still reading comics and banned them from the house. Even though she loved science fiction and is now reading fantasy also, I’m not sure even now I could get her interested in Watchmen, which I think is one of the best novels ever written. 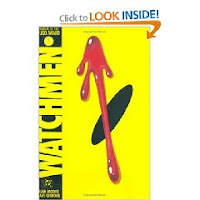 I had to overcome my own inhibitions in buying Watchmen. I, too, kept thinking, “Oh, it’s just a comic book. How good can it be? And how good can it be, with colour pictures and balloon writing over characters’ heads?” Well, as Castle Waiting showed me last month, and Watchmen this month, good writing is in every genre. It is, as always, up to the artists to be true to their vision and to write – create – to the best of their ability – the story they want to tell. Do you think we carry a cultural message that comic books are for kids only? That it’s somewhat shameful to read them, on a level below say, reading science fiction? I hate that reading graphic fiction is looked down upon by the literary arts, and I have to get it into my mind that it is more than acceptable to read. It can only be taken seriously when people like you and I take it seriously. Again, I am very grateful to Nymeth and Susan for allowing me this grand opportunity to read something outside my comfort zone, to connect with a fellow blogger in a more intimate way, and to experience the fun, excitement and intellectual stimulation of a book club experience. I’m glad you and Susan had fun, Molly! Thank you so much for joining. Oh Molly, you did a fantastic job with this! I kept smiling and laughing while I read it, since it was my emails up there, my thoughts about it! And I still totally agree with everything I wrote to you about it!! Thank you so much for your hard work in putting my emails to you into some kind of format your readers could understand!!! It was so much fun, to do this challenge with you Molly 😀 I’d like to do another one with you when we happen to be reading the same book around the same time!! !